Yankee Candle is already over Halloween and is plugging a new Thanksgiving Dinner line which includes Cranberry Sauce, Sweet Potato Pie, and *drum(stick) roll* Turkey and Stuffing. You can dress them up like a pilgrim or a turkey pilgrim. 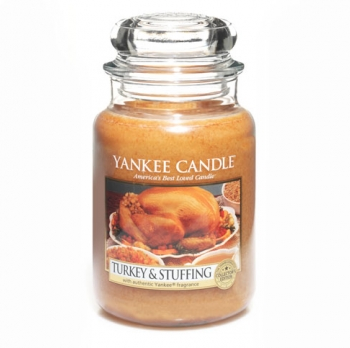 I love turkey, stuffing, and candles so I went in for a whiff. Um, it smells horrible! As I expected! It sort of smells like meat, nutmeg, wax, and something else that I can't place but was certainly weird. Please don't buy this.